This year at the Chain Link conference I decided to challenge myself and take classes that really stretched my yarn crafting boundaries. My first 2 classes were on Thursday with the talented Vashti Braha. “Tunisian Eyelet Meshes: How to turn TSS into Lace” and “Tunisian Filet Lace: Skill Building Basics”. I’ve always struggled with Tunisian crochet but thought that taking a class with Vashti could change that. 2 years ago I took her “All About Love Knots” class and finally felt I had a basic mastery of a stitch that had always mystified me. In fact Vashti made the love knot seem incredibly easy in that class, so I hoped for the same result taking Tunisian classes with her. Once again Vashti presented the work in such a way that it really made sense to me, and though my “Ah Ha!” moment took a little longer this time, by the end of each 3 hour class I felt confident in my ability to re-create the techniques she was showing us. The only homework we had for either class was to review the Tunisian Simple Stitch (TSS). I hadn’t really gotten a chance to do that and I’ve never been all that happy with my TSS fabric. Fortunately Vashti got us started with our class swatch doing TSS, and that helped. My dear friend Jan was taking the class as well, and she was able to point out some simple tricks that improved my TSS, so I was ready to tackle the techniques that Vashti was introducing. I confess there was a little time there that I began to think Tunisian crochet and I were never going to make friends. One of the funniest moments in class happened when Vashti was talking about the lovely vest she was wearing. She told us that it was made with 1 ball each of 2 very expensive yarns. She wasn’t sure how large a piece of fabric she was going to be able to make. So she made a length of fabric, then cut the armholes for the vest. The entire room gasped in tandem, and Vashti giggled. She assured us that it wasn’t as drastic as it sounds. From this adventurous experiment was born the “Maze Vest” and the pattern is available in the 2014 Summer Issue of Interweave Crochet Magazine. You can see photos of the vest from the magazine and find out more info on Ravelry.com. The afternoon class was “Tunisian Filet Lace: Skill Building Basics”. It was really fun seeing all the ways Vashti had applied her ideas of using Tunisian style crochet to create traditional filet stitch patterns. She had loads of swatches to show us and some beautiful designs as well. Check out her “Aero” wrap. I worked successfully on my swatch in class, but have to admit I’m not sure how I did it now. One of the best things about taking a class with Vashti though is that she always provides a good hand-out that helps jog my memory once I am re-covered from “conference brain” and I get a chance to sit down and play with the techniques again. 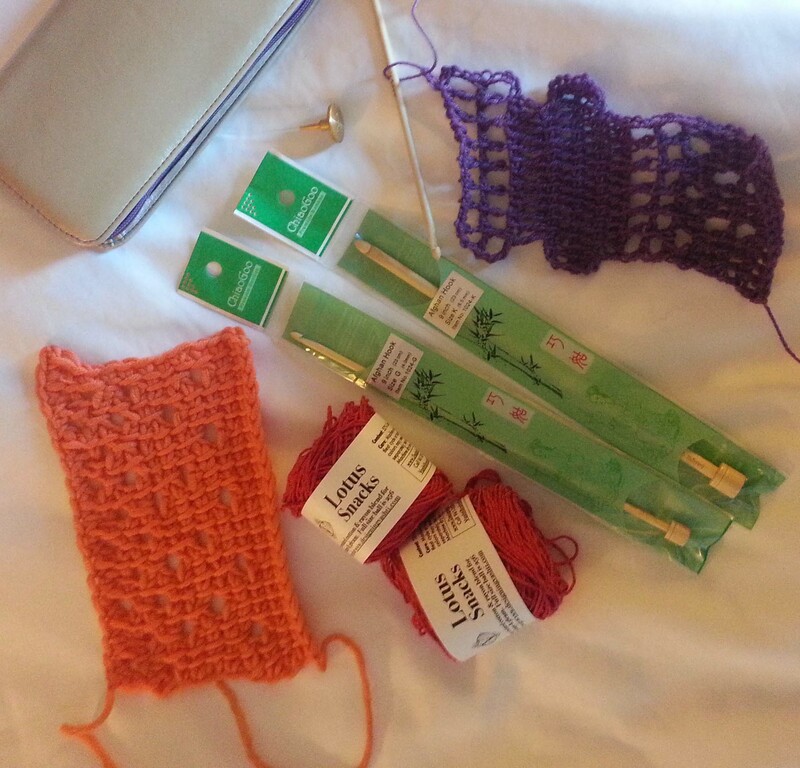 My Swatches, hooks and yarn from Vashti’s class. Vashti very generously shared “Lotus Snacks” with her students, these were 80 yard balls of her new “Lotus” yarn from Designing Vashti. This yarn has a Z-twist making it ideal for crochet with terrific stitch definition. The yarn comes in 14 colors and you can order it on Vashti’s Website. I ended up with 2 balls since I took 2 classes, I picked the “Rose Red” colorway. It was the most popular color in the class. I really liked the color as it is a cool red shading more into the violet spectrum than orange. She also handed out a Tunisian hook in each class. These were provided by ChiaoGoo which was very kind of them. Vashti showed us a wonderful thing about Bamboo hooks is you can adjust the shape of the hook easily with an emery board if you want. If you get an opportunity to take a class with Vashti I highly recommend doing so. She is a talented teacher who continues to explore the boundaries of crochet and share that with her students. 2015’s Chain Link Conference (aka The Knit & Crochet Show) will be held in San Diego, California July 22nd thru 26th and there will be lots of wonderful classes to take. Very cool, thank you for the detailed description. I esp. like that you mentioned tweaking the bamboo hooks, that’s something a lot of folks probably don’t think about doing.